Wi-fi devices - laptops, PSPs, iPhones - have become nearly ubiquitous. But wi-fi access has not. Airplanes, airports, trains, buses… there are many places where wifi access is expensive, impractical or impossible. Bypassing the internet-at-large, Media Res Servers are “local media servers” which broadcast canned media to wi-fi devices over several hundred yards. Someone with an iPhone, for example, can now enjoy broadcast content on the subway. In July of 02007, A&E and Southwest Airlines licensed Media Res Servers in an exclusive deal. Southwest Airlines has no in-flight entertainment on its flights, so A&E is providing their programs free of charge to Southwest passengers. 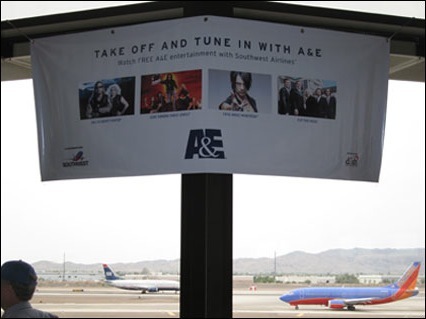 A&E programs are now available to any Southwest passenger without requiring any physical distribution or staffing; passengers simply access the server like any other wi-fi network, and then download their favorite shows to their device.